Soooo baby no. 3?! I know right. I feel like in this day and age anyone who has more than one gets an immediate "another one?" I know what you're thinking and I probably have thought it too haha. I have put off writing this blog post for some time now and I've always been an open book but it's been hard to put into words how I'm feeling. Let's just say I'm excited but not without nerves. First off let me start with -- we are thrilled to grow our family in any capacity, especially another person. I feel so incredibly fortunate to get pregnant easily and to so far have 2 amazing healthy born kids already. I have never had any complications or miscarriages and sincerely feel blessed for that. Dylan and I have faced many many other challenges in our life and marriage but that has not been one of them thank goodness. I think it's pretty easy to feel a little nervous to share the news that you're having another baby after your 2nd. People don't really care to be honest, and that's totally okay cause guess what WE DO, and we get to have the baby. Enough said. But when you go to share with people you don't necesarilly want them to have a less than enthusiastic response. I'll admit I have had mixed feelings. I have always wanted a big family and knew we would have more children. I thought I would be so excited but my first reaction was kind of "OH. Wait..." Silly right? I think the idea and the reality of a new baby are much different things, and I would know. Ive done it twice. So this time around I thought life would magically be different. More financial stable, bigger home. But here's the thing. I've had lots of time to think about this and what I always come back to is what matters. Our families, our memories, and what makes us happy. And you know what my good friends have reminded me countless times over the last 14 weeks... IT ALL WORKS OUT! And they are so right. There's a funny thing about life, it just keeps going and it usually works out and things typically are as they are supposed to be. So yes, we are very excited to welcome a new baby to our family. Even the 3rd and even the next one if we choose to have more. It has taken me some time to warm up, I think it's good to be honest about that. This baby was no surprise to us but the emotions and insecurities that followed were most definitely unexpected. I know many moms can relate to this. Less than ideal circumstances, less than growing financial security, a husband going back to school and working full time.... It's a lot to think about! But babies are the purest and sweetest blessing there is no matter when they come and our boys can not wait to find out if they're having a baby brother or sister. Dylan and I are convinced it's another boy. My mind can't comprehend a girl but that would be a very pleasant surprise. If you shared a congratulations or thoughtful word here online, Instagram, or in person... THANK YOU from the bottom of my heart. No matter if it's your first or last every pregnancy should be celebrated and appreciated and it always feels so good to have the support and love of those around you. In some ways I feel like a total vet, and yet this is a new pregnancy, a new baby, and a new time of life so I'm trying to take everything slow, really appreciate it for what it is and remind myself over and over THESE ARE THE GOOD DAYS. Having babies, little ones, and a growing family is the biggest blessing and I can't believe how fast time passes. Feels like yesterday I had Dash! 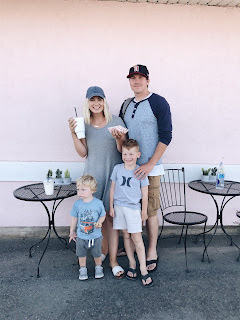 (Not excited for him realizing he is the middle child HA) Anyways, It took me a while to feel comfortable to announce and now I am so excited to just enjoy it and prepare for this new little babe due in JUNE!